Despite the popularity of Japanese anime in the Western market thesedays, there are still a few titles that pop out of nowhere and surprise me. These areusually films I'd never heard of or didn't know existed. In the case of BattleAngel, this is a good thing, as the film is one of the better pieces of Japanesesci-fi to come along in quite some time. 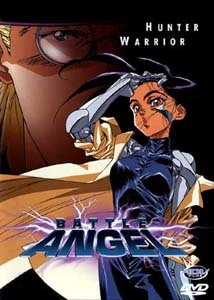 ADV's release of Battle Angel is theanimated incarnation of Yukito Kishiro's Japanese comicGunnm. The story is set in a distant, non-descript, futuristic wasteland. A huge town, knownas "Scrap Iron City," exists below another gigantic, hovering city called "Zalem." While Zalem is the ideal society, the world on the ground simply lives off of thetrash Zalem dumps on them, and one cannot be inducted as a resident of Zalemwithout having been born there. In this world, completely natural humans seem tobe the exception, rather than the rule. Almost everyone has used cybernetics toalter their abilities, and even people who have died have had their brainsinserted into robotic bodies. Because of this, the market for parts is lucrative,and the most common thieves are those who steal organic spines or other importantcybernetic materials. While searching through Zalem's rubbish, cybernetic engineer Dr. Idodiscovers the torso of a cyborg that's still partially alive. Ido manages to save thebrain and reconstructs a fully functional female cyborg he calls "Gally." Gally andIdo develop a friendship, but eventually Gally wants to pursue her own goals. So she becomes a bounty hunter, killing Scrap Iron City's criminals for the prices on their heads. Things do not remain simple, especially when Ido'srival Dr. Chiren attempts to destroy Gally with her specially engineered gladiatorcyborgs. Despite its short length, Battle Angel is packed with detail, story, and action. On the bad side, this 60-minute feature (the only filmedmaterial based on the Gunnm comic) is woefullyincomplete. Focusing on the good, though, the movie is one of the best"cyberpunk" anime films I've seen. Despite all the hype surrounding Ghost In TheShell, I liked the heart of this film better. Its themes of emotion and dreams of Zalem are presented in a balanced, fast-paced manner, rather thanthe overlong, teary-eyed monologues that tend to populate anime. The film's world is fascinating but cruel, since the internal workings of themysterious "Factory" that runs Scrap Iron City are never revealed, nor are any facts about Zalem. The film is pretty violent, as you might expect. Heads definitely roll, and Gallynever hesitates to pummel a cyborg into mush. In fact, one the most inventivetouches in the movie is Ido's great, rocket-powered hammer with which he tears badguys limb from limb. I don't mean to sound like I love gore, but the Japanese definitely have an artistic way with violence. Regardless, this is not one for the kiddies. Image Transfer Review: This is a very good image for an animated film. The colors are rich and wellbalanced with very clear black level. There is no artifacting and only a fewminor background shimmers. Theoriginal print isn't exactly pristine, but it works and the mastering is top-notch. Subtitles are very easy to read, overlaid on the full screen image without distracting from the action. Audio Transfer Review: Surrounds are used for a variety of background sound effects and music enhancement. The front channels handle most of the action and there are a lot of directionaleffects. Dialogue is extremely clear and well balanced with the rest of the audio. Unlike some Japanese animation on DVD, both English and Japanese tracks are2.0. (Some studios habitually release 5.1 remasters for English tracksonly, which has not gone over too well with fans.) The dubbing is acceptableif somewhat flawed; I can't recommend it, but if you cannot stand subtitles it willdo. Extras Review: The presentation of Battle Angel is fairly impressive. The most notableextra is the collection of 12 trailers for other ADV releases, covering such anime staples as Neon Genesis Evangelion, Ruin Explorers, andSlayers. The disc also features 2 galleries of artwork from the film, one focused on conceptual art with the other featuring stills from the actual movie. The end credits to each of the two "episodes" are also presented in dual format. Using the angle change button on your remote, you can view either the NorthAmerican localization credits or the original Japanese credits. It's too bad that these 2 half-hour episodes are the only animation based onGunnm. Still, this DVD is an entertaining, fast-paced way to spend an hour andwill fit well into any anime collection. Highly recommended.